Years ago Thomas and Martha Wayne travel down a country road in Kansas. Something streaks across the sky and crashes nearby. The Waynes investigate and find a strange device that Thomas, against his wife's advice, reaches into and touches. 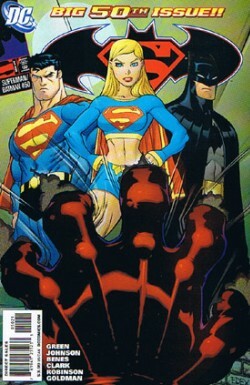 In the present the Justice League and Supergirl help rebuild Smallville. A small, metallic device is uncovered and when Superman touches it the device activates. At the same time a similar device is activated in the Batcave and proceeds to take over the technology inside. Alfred alerts Batman, who heads to Gotham as the Titans fight the monstrosity that was created by the formerly small object. 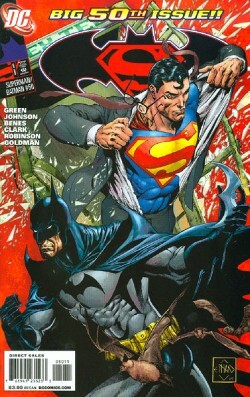 With Superman and Batman's help they stop the rampage and when the two touch what is left they find themselves experiencing something from the past. They "watch" as Thomas Wayne's mind is transported into a form designed by Jor-El. After helping Thomas out of a spot with the Kryptonian authorities the two travel to Jor-El's home where the scientist explains that he sent probes to various worlds to see where he should send his son. Thomas subtly suggests that Earth might be the best place before his mind is returned to his body. The shared viewing ends and both Batman and Superman journey to the Batcave to check on Alfred before heading to the Fortress of Solitude where the two heroes are faced with the combined forces of their greatest enemies. The fight begins quickly but soon Batman deduces this is another mirage and has Superman get the crystal that was responsible for everything. Batman travels back to Gotham and reads a journal left behind by his father, recently uncovered in the cave's destruction. Superman stays at the Fortress and both men learn through their fathers that what they saw was real and that, in a strange way, without Thomas Wayne meeting Jor-El there might not have been a Superman or Batman. Story - 3: All right, I am going to admit it. This wasn't a bad issue. The plot was sound. The dialogue was decent. The characters stayed in character and a story was told that held some interest for me. So why did I give it a three out of five? Because I have this thing against "untold tales of the past" that link characters in a fairly preposterous way. To me this story is an example of how putting someone's chocolate into someone else's peanut butter isn't always a good thing. Here's the thing; Superman and Batman are great characters that are unique in the comic book world as having two origins that could be told in just about any era and still work. You can't say that about the Hulk or Captain America or even Wonder Woman, as Greg Rucka once alluded to in an interview of the comic book conversation podcast Word Balloon. Some of the best Elseworlds stories, such as GOTHAM BY GASLIGHT and KAL, are great examples of how you can take Superman and Batman into the past and tell a compelling story. They both have wonderful origins but that doesn't mean you should connect the two. Now don't think that I'm not hip what Green and Johnson were going for. They were taking a title co-starring Batman and Superman and trying to show how the two connect together on an emotional level and the best way they found to illustrate this was to have Thomas Wayne end up being the one who was responsible for Jor-El sending his son to Earth and that thanks to some Kryptonian technology Thomas was able to reverse engineer some fancy stuff and build his fortune and eventually give Batman the means to fight crime. So if it wasn't for a chance encounter on a lonely Kansas road two legends might have never come to be. The main problem I have with this is that it dilutes both histories. If you want to go real world for a moment you could suggest that without Superman there would have been no Batman because it was the success of the Man of Steel that led to the creation of the Dark Knight, but that doesn't mean the comics should reflect that. The two characters work so well in their own right because their origins are distinctive. To connect the dots in this fashion weakens that, at least to me. It's also poor writing. Poor, sitcomish writing. I mean this is like Tony and Angela from WHO'S THE BOSS finding out they went to summer camps across the lake from each other and may have been each other's first kiss bad. It makes for a dramatic story but when you break it down it's so flawed and clichéd or at least clichéd in the bad way where it is just the writers pulling at the reader's heart strings for lack of a better story. The whole "brothers" thing at the end was the straw that snapped the camel's spine for me. It was just too much, again at least to me. I also have an issue with Thomas Wayne building the tech side of the Wayne family business with alien technology. I always preferred the Thomas Wayne that was a doctor and left the running of his business to more interested people. Even if you were going to have Thomas be a techie kind of guy having the tech come from an alien source takes away from him as an inventor. Sure it takes a man of high intelligence to find uses for advanced alien technology, but it just seems like the guy who comes up with neat stuff without an assist makes for a better and more rounded character. It wasn't like this story was awful. The writing was even strong in places and I liked the fact that I was wrong that Green and Johnson weren't going to have a continuing continuity, but as good as the writing was in spots there were others where Green and Johnson just beat us over the head with the whole "We're so different and this is how" thing they had going between Superman and Batman's internal monologues, which is another tool that is getting old real fast. I am certain that the writers had the best of intentions going into this story but it just didn't work for me. There are people who may like the connecting of the two origins but for me it not only smacks of the Silver Age but waters down what makes both characters special. Art - 4: The artwork, across the board, gets a solid four this month. Jam issues are always a tricky proposition. To me comics are a fantastic art form because of the mix of art and story and how the two gel together. Switching artists during the course of a story is like switching up musicians during a concert. It can be done but it might ruin the flow. Thankfully this didn't happen. The various artists on this book all have their distinctive styles but either the styles were similar enough not to interrupt the momentum or the style fit the scene, as in the Thomas Wayne on Krypton sequence. The issue looked great even if I had problems with the story itself. Cover Art - 5: Well, that phone booth has seen better days. Despite my persistent quibble with how Van Sciver draws Superman this was an amazing cover and perfect for a milestone issue such as this. You want something big and bombastic to mark such an occasion and these days a comic getting to issue fifty is something to be proud of. The composition is neat and splits the two factions of this book into their own area and atmosphere. The interesting thing about this cover is that in the signature box the year '05 is given. So either DC commissioned the fiftieth issue cover back in 2005 (and given the general lateness of this title for some time I could believe it) or this cover was to be part of the Verheiden/Van Sciver arc that was plagued by said lateness. Either way I liked the cover. Alternate Cover Art - 5: Another neat cover that looks like it belongs to another storyline. Still, Ed was the artist that began the SUPERMAN/BATMAN journey so it is fitting he be part of the celebration. His Supergirl is interesting. Don't know if I like it but definitely interesting.